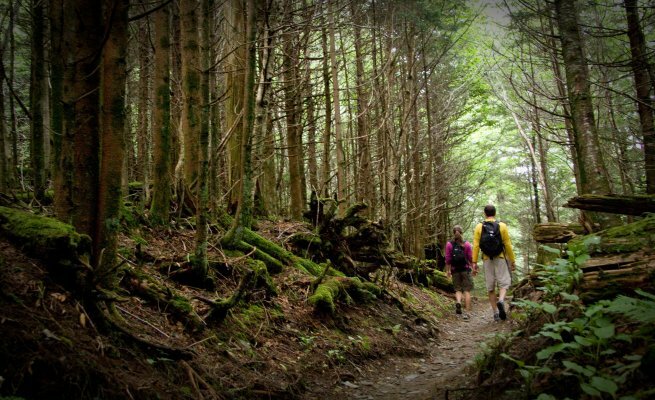 Enjoy a guided hike with the experts at A Walk in the Woods and a guided whitewater rafting trip on the Pigeon River with NOC! Begin your day with an adventurous rafting trip on the Upper Pigeon River - with 5 miles of big splashes, the Upper Pigeon is one of NOC's most exciting trips. After your five-mile Pigeon River trip, you'll have time to grab lunch & meet up with your guide from A Walk in the Woods! Spend the afternoon exploring the hidden world of charming small Appalachian Mountain waterfalls. You will visit several waterfalls along an unmaintained trail through old farm fields - a moderately strenuous hike that we recommend for ages 8 and up. NOC's Pigeon River Outpost has a park-like setting, with convenient parking, an impressive picnic pavilion, a shady riverside path, and a gigantic field for playing volleyball or a simple frolic.